Forest-inspired music: part fifteen | Through the seasons before us.. I feel robbed and cheated of what was supposed to be the crowning glory of this particular avenue of blog posts. This was the triumphant song that I was going to post to aid our celebrating the build up of a trip to Wembley, as such, it is now posted with bitterness and disappointment given that we managed to implode and miss out on such an opportunity. It’s by a band who are still active, I believe – called Resistance 77 – and was recorded to commemorate our Littlewoods Cup final appearance in 1990, partially suggested by Stuart Pearce who being a bit of a punk himself had been to a few gigs by the band. The single sold around 2,000 copies apparently, which is pretty impressive given the probably limited market for Forest-inspired punk music at the start of the 90’s! It makes frequent mentions of the current team of the time, as well as regular returns to the theme of Wembley, which of course was the venue for said final. It’s undoubtedly cheesy, because all football songs are, but I really like it nonetheless. 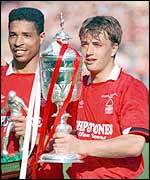 Certainly it epitomises the time when I personally fell in love with Forest and I suppose if I had to have an ‘our song’ for me and Nottingham Forest, then this would be it. It’s simply called You Reds!, and it rocks! Pearcey is still watching them! He went up to Blackpool to see them in a punk festival a coup;e of weeks ago. Don’t do “You Reds” now.